In a mixer, combine all the cannoli shell ingredients except the egg wash, adding enough water (1 to 2 tablespoons cold water) until it reaches a doughlike consistency. The amount of water will vary according to the outside temperature/humidity. Roll the dough to the thickness of pasta (1/4 inch). Using a cannoli cutter (an oval-shaped cookie cutter), cut out the cannoli. Place the cannoli ovals in a row and place a small cannoli rod down the center. Flip the cannoli up and over, sealing the opposite edges where they meet with egg wash and pressing down. Deep fry them for 3 minutes, until golden brown. Combine all filling ingredients. 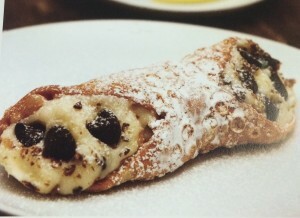 Let the cannoli shells cool, then using a large-tip pastry bag, pipe the ricotta mixture into the cannoli. Serve, sprinkled with confectioners’ sugar.